Seven of Nine, played by Jeri Ryan, is an honorary crew member who spends most of her time in the astromentrics lab. Seven's family was assimilated by the borg on her sixth birthday, aboard the USS Raven. After 18 years as a drone, Seven was liberated from the collective by Captain Janeway. She struggles to regain her humanity and fit in with the crew. Seven's human name was Annika Hansen, however, since she has few memories of her time as a human, she chose to keep her borg desination. Seven has developed many friendships during her time aboard Voyager and has become a valued, trusted member of the senior crew. 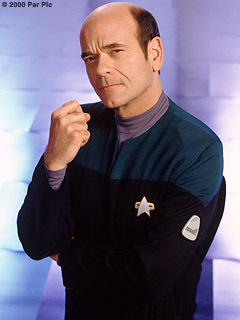 The Doctor, played by Robert Picardo, is a holographic program, designated Emergency Medical Hologram, or EMH. His program was created on Jupiter Station by Dr. Lewis Zimmerman. The EMH was designed to supplement the Chief Medical Officer of a starship during a crisis. Voyager's EMH, however, has been the crew's primary physician since the human doctor was killed by the caretaker's array. THe Doctor has evolved far beyond his original programming. He has learned to sing opera, fall in love, and even joins away missions. He has worked his way into the hearts of the crew, and is no longer a mere hologram.